A central issue in the mathematics curriculum is that we want students to make connections. This issue has been analysed in a series of curricula and instruction design and analysis studies. Moving towards mathematics connections—and away from treating mathematics as a body of isolated concepts and procedures—is an important goal of mathematics education. Although many studies identify “whole number bias” in learning fractions, few studies have examined how this bias may be overcome. In this paper, I aim to clarify how problem variation in Chinese textbooks helps to make concept connections between fractions and whole numbers. 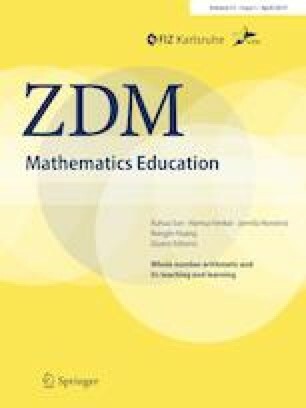 To the best of my knowledge, this study systematically addresses the central issue of using the unity of four fraction operations and whole number arithmetic to overcome long-standing whole number bias for the first time. The lack of such methods represents a significant gap in curriculum practice. This study’s framework for understanding variation practice to make connections, with an emphasis on the invariant concepts, also is helpful for the analysis of textbook or instructional design, which represents another significant gap in curriculum development theory. This study was funded by the research committee of the University of Macau, Macao, China (MYRG2015-00203-FED). Ma, L. (2013). A critique of the structure of U.S. elementary school mathematics. Notices of the American Mathematical Society, 60(10), 1282–1296. http://www.ams.org/notices/201310/fea-ma.pdf. Sun, X. H., & Bartolini Bussi, M. G. (2018). Language and cultural issues in the teaching and learning of whole number arithmetic. In M. G. Bartolini Bussi & X. H. Sun (Eds. ), Building the Foundation: Whole Numbers in the Primary Grades. New York: Springer Press. http://www.springer.com/gp/book/9783319635545.